The Animal Health Trust is a charity that has been helping dogs, cats and horses for more than half a century. We provide specialist veterinary clinical, diagnostic and surgical services and our successes in research have ranged from major breakthroughs in anaesthesia and surgical techniques to the development of vaccines against diseases such as canine distemper and equine influenza. Our scientists and veterinarians, many of whom are world leaders in their field, work alongside bringing together a wide range of expertise for a co-ordinated attack on animal diseases and injuries. By publishing scientific papers, speaking at conferences and talking to other veterinary surgeons about the cases dealt with, this knowledge is passed on to benefit the maximum number of animals. The canine genetics group is a small team of skilled personnel that liases with clinicians, other scientists within and outside the Trust and dog owners and breeders alike. This unique partnership is what makes the AHT’s research and DNA Diagnostic Service so successful. The genetics group strives to understand the genetic basis of inherited canine disease. The long-term goal of the work we undertake is to identify the genetic mutations that cause inherited disease and develop DNA tests that identify those dogs which carry these causal mutations. Breeders can use the information gleaned from these tests to instigate appropriate breeding programmes that avoid the production of affected dogs and aide in the eventual elimination of inherited disease from breeds at risk. The chromosomes are made up of deoxyribonucleic acid or DNA. DNA is a long, double stranded, very complex molecule composed of 4 different building blocks or nucleotides (abbreviated to C, G, T and A). It is divided into ‘genes’; every gene is literally a written instruction that codes for the production of a single protein. There are probably about 30 – 40,000 different genes within the DNA of every dog. The dog has 2 copies (or alleles) of each gene, one on the chromosome it inherited from its mother and one on its paternal chromosome. The proteins that are coded for by these genes interact with one another in very specific ways within the body to perform all the functions necessary for life. The order of As, Gs, Cs and Ts within a gene needs to be exactly right for the cells to make the correct proteins; ‘misprints’ or mutations within genes can lead to ‘faulty’ or non-functional proteins and these, in turn, can give rise to disease. L-2-Hydroxyglutaric aciduria L-2-HGA (L-2-hydroxyglutaric aciduria) in Staffordshire Bull Terriers is a neurometabolic disorder characterised by elevated levels of L-2-hydroxyglutaric acid in urine, plasma and cerebrospinal fluid. L-2-hydroxyglutarate is normally metabolised to a-ketoglutarate but in affected dogs it is not, and builds up in the body with devastating results. L-2-HGA affects the central nervous system, with clinical signs usually apparent between 6 months and one year (although they can appear later). Symptoms include epileptic seizures, "wobbly" gait, tremors, muscle stiffness as a result of exercise or excitement and altered behavior. 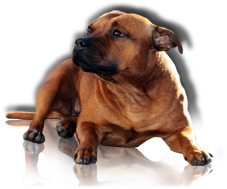 Hereditary Cataract Hereditary cataract in the Staffordshire bull terrier was first reported in the United Kingdom in 1976. The condition is not congenital, so puppies are born with normal eyes, but cataracts begin to appear at a few weeks to months in age, progressing to total cataracts by 2 to 3 years of age. This cataract is always bilateral, symmetrical in the two eyes, and progressive until total with resultant blindness. Both HC and L-2-HGA are autosomal recessive conditions. This type of disease is caused by a mutation within a single gene located on one of the 38 pairs of autosomes. Mutations causing recessive diseases can be small (for example a single incorrect nucleotide, or the insertion or deletion of a small number of nucleotides) or large (such as the deletion of a large number of nucleotides). Because the mutations are within genes located on the autosomes both males and females suffer from the disease with equal frequency. A dog has to have a mutation in each copy of the gene (i.e. the copy on each of its chromosomes) before it will actually develop symptoms of the disease. This is known as being homozygous for the disease allele. If it has one mutated copy of the gene and one normal copy it will be a carrier of the disease but will never actually develop symptoms. It can, however, pass the mutation onto future generations. For a dog to be affected with an autosomal recessive disease, both its parents have to be either carriers or affected. If two carriers are mated together on average one in four of their offspring will be affected, one in four will be genetically clear and half will be carriers. CLEAR: the dog has 2 copies of the normal gene and will neither develop HC / L-2-HGA, nor pass a copy of the HC / L-2-HGA mutation to any of its offspring. CARRIER: the dog has one copy of the normal gene and one copy of the mutant gene that causes HC / L-2-HGA. It will not develop HC / L-2-HGA but will pass on the HC / L-2-HGA mutation to 50% (on average) of its offspring. AFFECTED: the dog has two copies of the HC / L-2-HGA mutation and is affected with HC / L-2-HGA and will develop HC / L-2-HGA during its lifetime. Clear X Clear All puppies will be clear. 50% of puppies will be carriers. Clear x Affected All puppies will be carriers. 25% of puppies will be affected.